"A page from the 15th century French illuminated manuscript MSS 122 in the Boise State University Library Special Collections. Dimensions: 9 × 8.5 cm. The manuscript is from a book of hours, and the page shown partially covers the liturgy of the octave of Saint Andrew." The reader and the hearers stand to pray and listen to the Word and say, "Amen," as Nehemiah describes when Ezra reads aloud. 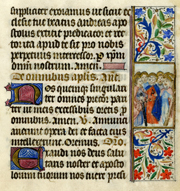 Nehemiah in the Liturgy from a book of hours, from Art in the Christian Tradition, a project of the Vanderbilt Divinity Library, Nashville, TN. http://diglib.library.vanderbilt.edu/act-imagelink.pl?RC=55356 [retrieved April 20, 2019]. Original source: http://commons.wikimedia.org/wiki/File:Boise_State_MSS_122_2_crop.jpeg.